Congratulations, Mexican smugglers! You finally found a way to make the Ford Fusion interesting, albeit in the most illegal way ever. 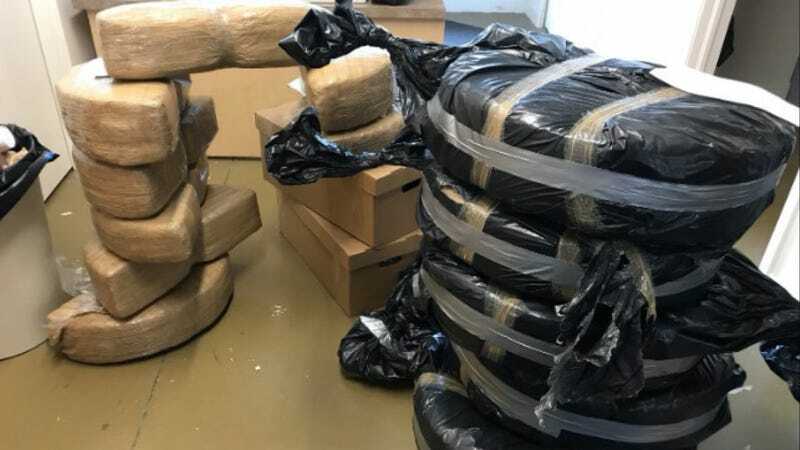 Marijuana worth $1 million was discovered in the trunks of new Mexican-made Fusion sedans at a dealership in Ohio, reports CNN. This isn’t the first time this has happened, either. Ford makes Fusion sedans at its Hermosillo, Sonora, Mexico plant, which then shipped these cars via rail to a CSX yard in Lordstown, Ohio, per Silverio Balzano, the DEA agent over the Youngstown, Ohio, office who spoke with CNN. A Ford dealership in Youngstown found the marijuana motherlode in its new Fusions between July 7 and 11. Weed-hauling Fusions were found in 15 cars across four counties in Ohio, and two more were discovered in Pennsylvania. Pot was packed into half-circle shapes that fit nicely into the car’s spare wheel well, with each wheel weighing 14.5 kilos, or just shy of 32 pounds. Authorities are trying to discover not only where it came from, but also who failed to pick up the sticky icky along the way. Ford’s Hermosillo Stamping and Assembly Plant also produces the Fusion’s badge-engineering mate Lincoln MKZ. I guess this explains why they’re getting smuggled into Fusions of all things. Look, cartels: think this through. A Fiesta owner would be far more likely to just quietly keep the find of the century in his rear trunk and smoke it with his buddies without ever calling the authorities. Meanwhile, the older buyers of the Fusion tend to include the kind of people who call the cops on you if you’re using your lawnmower too early, much less if they find giant bricks of weed in their trunks—as one 87-year-old Fusion buyer did in Minnesota several months ago. We’re aware of the situation and are taking it very seriously. We are working with the FBI and Customs on an extensive investigation. We have confirmed that this is not happening at our plant or at our internal shipping yards. CSX also says they’re cooperating with authorities in finding where the drugs may be puff-puff-passing into America. Pot-carrying Fusions have also been found in the Phoenix area in addition to Minnesota and Ohio. Gets You High, Don't It?